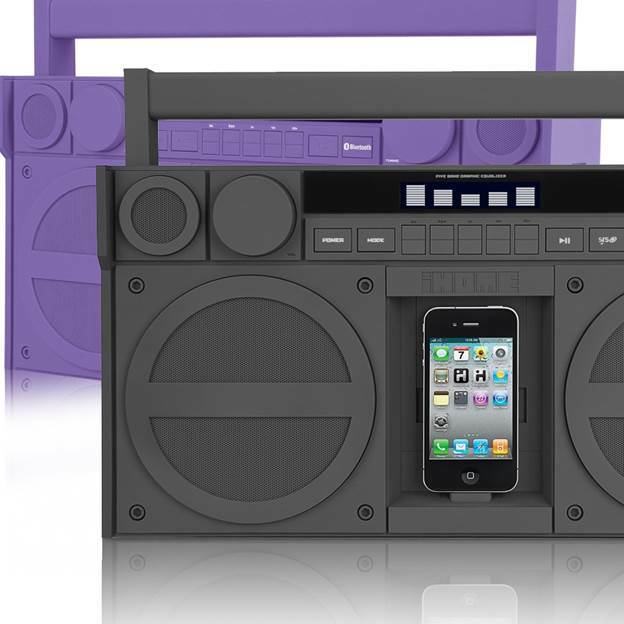 A than two decades, the boombox is-Iike all things '80s in origin- slowly making a comeback. It's only natural, then, that someone should come along and harness its iconic design with modern technology in the form of a portable Bluetooth speaker system. In this case, that someone is prolific audio purveyor iHome, and the something is the IBT44 Boombox. 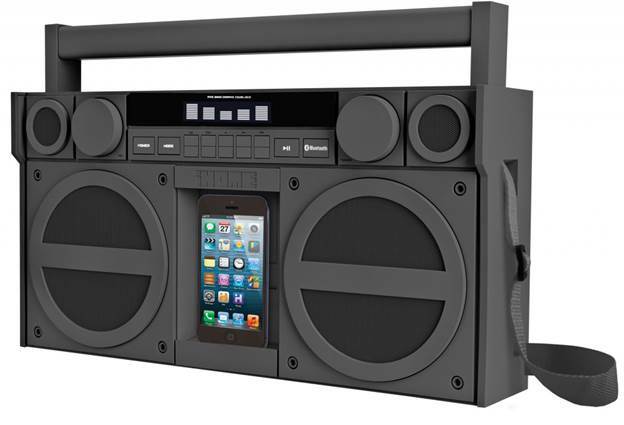 This $199.99 system boasts twin 4-inch woofers and 1 inch tweeters enclosed In what can best be called a 2014 reinterpretation of the classic boombox design. In addition to the requisite speaker drivers, the device sports a large LCD display, FM radio tuner, hefty volume and tuning knobs, an Infrared remote, and a five-band equalizer with physical buttons. It's that last feature that is one of our favorites, but the IBT44 sounds good even before you start fiddling with its mids, highs, and lows. The sizeable drivers put out considerable volume-practicaIIy a must for something claiming to be a boombox- but bucking the “volume over fidelity" trend of Its predecessors, this box sounds remarkably hi-fi, too. Excellent sound quality. Physical equalizer makes it easy to customize the sound to your liking. Retro throwback design makes it easy to carry. In tackling a variety of musical genres and podcasts during our testing, the IBT44 proved itself to be a multitalented sound system, replicating voice and Instruments with exceptional fidelity and range. It was also impressive to hear such a wide soundstage being produced by such a compact device, especially one in which the highest highs and lowest lows kept from being muddled. Like we said earlier, the EQ is a great feature that gives you physical control over five frequency bands, so you can tailor its sound to your liking and the style of music you're Iistening to. We'd just Iike to have seen EQ adjustment buttons make their way to the included remote (just as we'd have Iiked more playback controls on the speaker itself). Actual speaker lacks track-skip forward and back buttons. Grip that holds device presses the power button if fully engaged. The ability for the IBT44 to run off AC power or six D-cell batterles is nice; in the latter case, we used it fairly intensively for four days without depleting its juice. It should be noted that while the device has a USB port for charging your devices, It only works when running off AC-too bad for those hoping for an emergency charging system when the power goes out. The bottom Iines. Overall, the IBT44 Is a great-Iooking, great-sounding, and highly portable offering we had a few slight quibbles with. Whether you're Iooking to blast tunes while strutting down the street, or just want something with awesome sound you can take everywhere, this is the box you’re after.